Sunday, April 22nd will mark the 48th Earth Day, a day where people around the globe focus on the environment. Along with Rachel Carson’s famous Silent Spring, Earth Day is credited with launching the environmental movement. Many landmark legislation pieces like the Clean Air, Clean Water, and Endangered Species Acts have been the result of Earth Day initiatives. Plastic pollution has been designated as this year’s area of focus. In that spirit, we thought it might be useful to give a bit of background on what plastic pollution is and what you can do about it. So, what is plastic pollution? Well, plastic that is not being reused or repurposed is plastic pollution. Single-use plastic water bottles, plastic grocery bags, plastic cutlery and diapers are some of the worst offenders. Plastic is not biodegradable; instead, it breaks down into smaller pieces, called microplastics or microfibers. Microfibers are shed when you wash clothes made with synthetic fiber; microscopic pieces exit the machine along with the water. The fibers are too small for wastewater treatment plants to catch, so they end up back in our water sources, where they are eaten by marine life and work their way up the food chain. Diver Rich Horner has captured video of himself swimming through water densely strewn with plastic waste and yellowing food wrappers, with the occasional tropical fish darting around. The footage was shot at a dive site called Manta Point, a cleaning station for the large rays on the island of Nusa Penida, about 20km from the popular Indonesian holiday island of Bali. Source: The Guardian. 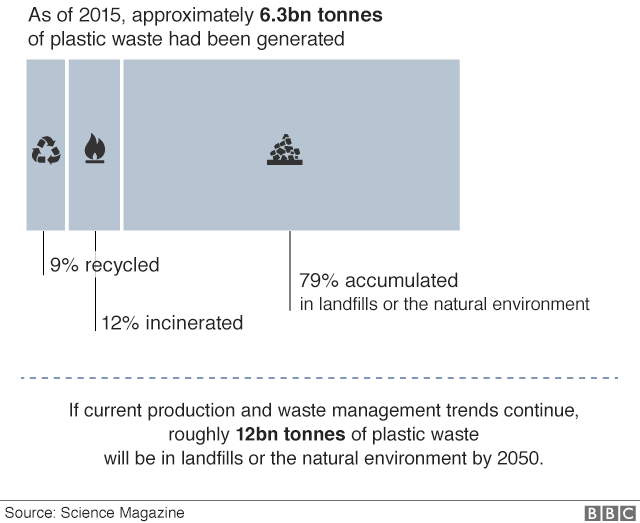 Where does plastic go? Some gets recycled (less than 10%) and some is incinerated (about 12%), but the majority goes to landfills or ends up in huge plastic patches in the ocean (to the tune of over 10m tons per year. One patch in the Pacific is bigger than Texas!). Don’t bag your produce- certain fruits and veggies don’t need that plastic bag! Carry a reusable water bottle- you can carry an empty water bottle through airport security and refill it once you’re past the metal detectors! Buy a Cora Ball and leave it in your washing machine to trap microfibers. Try purchasing natural-fiber clothes when possible. Compost- you’d be amazed at how much less trash you generate once you start composting. And since your trash won’t stink, you can stretch that plastic trash bag further. Pick up trash when you see it on the ground or in the water- it is probably made of plastic! Stop using plastic straws. Enjoy the straw experience? You can buy reusable bamboo and steel ones. Store food in reusable containers instead of saran wrap or ziplocks. Be a mindful consumer- avoid purchasing items with unnecessary packaging and avoid purchasing items that contain microplastics. Beat the microbead is a great resource. Don’t throw it away- donate! Groups like Freecycle.org frequently have folks that are in the market for what you are trying to unload. Check them out. When you have to buy a product containing or packaged with plastic, opt for ones marked with “post-consumer” or recycled plastic. Ask your town to consider implementing a plastic bag ban- check out this link for tips on where to get started. Write to companies with non-recyclable packaging and ask them to change their packaging. Catching their attention on social media is usually an effective way to get a response! Encourage your school or place of business to only use reusable glass cups and mugs. Encourage your school or place of business to have well-marked recycle bins and encourage people to use them correctly! You can find what is eligible for recycling on your town’s waste management website (or see handy pic below). Organize a school or work day of service event focused on beach, park, or sidewalk clean ups.